Caleb DeGroote joined the Rockville Brass Band in the summer of 2014. He is currently the co-president of the band and the principal percussionist. Music performance, education, and competition have always played a large role in his life. 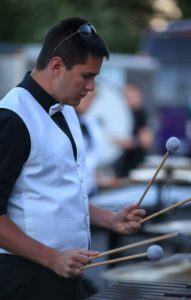 Since his first teaching position with the Naples High School Marching Band in 2006, Caleb has taught a total of 30 competitive seasons over 14 different scholastic programs, with these ensembles competing in New York State Field Band Conference, New York State Percussion Circuit, Tournament of Bands, Bands Of America, US Bands, and Winter Guard International. Caleb began his drum corps career with the Rochester Crusaders in 2008. After playing vibraphone in Drum Corps International with Citations in 2009, he spent four seasons (2010–2013) with the Empire Statesmen instructing the front ensemble. In 2014, he was the percussion caption head and front ensemble arranger for Windsor Regiment. For the 2015 and 2016 seasons, Caleb DeGroote was the front ensemble instructor of Fusion Core. His ensembles have placed in the top five in Drum Corps Associates / Drum Corps International seven times. He is an active competitive soloist, with two first-place finishes at the Mid-Atlantic Brass Festival Percussion Solo Competition (2016, 2018), and finished 3rd in 2017 and 1st in 2018 at the North American Brass Band Association Percussion Solo Competition. Caleb is a Sponsored Artist with Soultone Cymbals, Inc. and a Sponsored Percussion Educator with Innovative Percussion Inc. He holds a B.A. in Music and Political Science from Binghamton University, where he studied percussion with Dan Fabricius. He also holds an M.A. in Diplomacy from Norwich University.